Stuff By Belle: August Challenge-VLVS! Over at Viva Las Vegastamps! monthly challenges are BACK!! I for one am super excited!!! I love a challenge! I was inspired to do this tag. I used three VLVS! 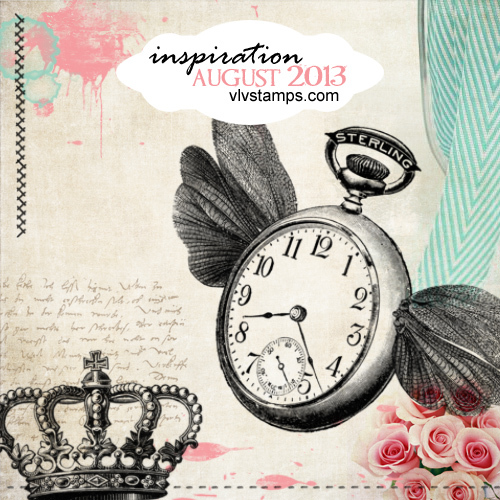 stamps: time flies, spiked fence and girl with wings (just the wings). I also used Gauche Alchemy punchinella (as a mask), mod podge and acrylic paint, Kaisercraft paper blossoms, May Arts jute and chevron ribbons, archival ink, Distress Stain, Tattered Angels glimmer mist, Distress Ink, Tim Holtz clock face and hands, button. Thanks for stopping by and I hope you are inspired to link up your own creation! Gorgeous tag!! I love the colours of the background.